Inspired by a beautiful photograph by Willard Clay, with his permission. This quilt is my favorite and creating it was pure joy. I used a Mickey Lawler SkyDyes fabric for the background sky, a wonderful commercial fabric for the trees and fence and created the barn fabric with textile paints. Although it may not be apparent in this photograph, the trees have ice on the branches, created with extensive metallic and holographic threadwork. 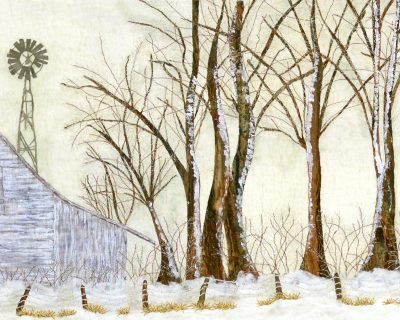 I used white opaque textile paint to paint the snow on the trees. 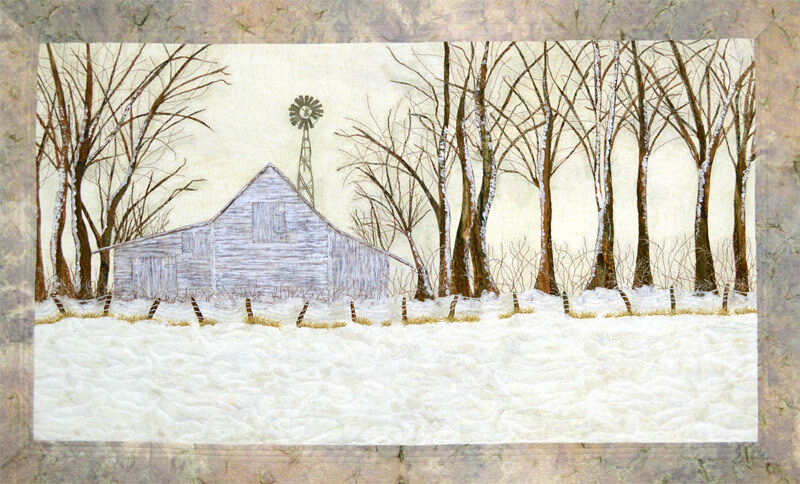 I wanted the snow in the foreground to be fluffy, so I molded a layer of thin batting over other “snow” fabrics , letting the underlying fabrics peek through. I placed a layer of white tulle over the top of this fabric sandwich and stitched it into place with invisible thread, following the same lines when I machine quilted the quilt. The batik border fabric really sets off this design.